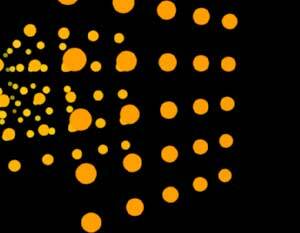 The Rendering group controls how the particles look when they render. Makes sense, right? This popup lets you choose how the particles look when they render. There are two Render Modes. 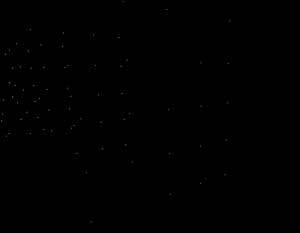 Motion Preview - This mode draws dots at each particle, a quick way to preview the motion of particles. Full Render - Full Render is the default mode. This creates the expected results rendering all particles with full scale, position and shading. This mode should be used for final output. Left to right, Render Mode set to Motion Preview and Full Render. Particular can now take advantage of the additional power of your graphics card (GPU) using GPU acceleration. In the Acceleration pop-up, you can select whether to use CPU (computer) or GPU (graphics card) acceleration. Accelerating with the CPU can sometimes be more reliable, but accelerating with the GPU usually speeds things up quite a bit. When using GPU acceleration, there are two options, found in the GPU Particle Rendering pop-up. Direct will render every particle. This will be more accurate, but the speed increases might not be as significant. Streaming will usually provide a much stronger boost to particle render speeds, but this doesn’t render as accurately as Direct does. Note that Streaming will not render some features, such as Blend Modes. 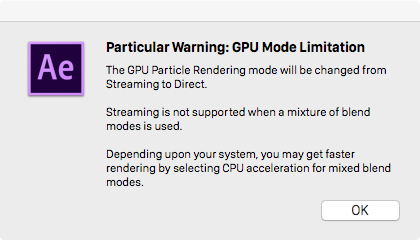 When Streaming is used and unsupported features are applied, a warning will appear, and Particular will use Direct rendering. Particle Amount lets you quickly change the amount of particles shown for previewing. This is especially useful when the Emitter> Particles/sec control is keyframed. Depth of Field (DOF) controls simulate the focus of a real world camera. DOF does this by mimicking the way that a real camera cannot maintain sharp focus in all depths of a scene. Depth of Field is useful for increasing the realism of a scene. It is also useful for matching your Particular effect to footage shot with a real camera where Depth of Field is apparent. By default, DOF is turned on with the Camera Settings option. Choose the Off option to turn off DOF. Read more about how to use Depth of Field. Left to right, Depth of Field set to Off and Camera Settings (On). This control sets the kind of render that Depth of Field provides. This setting only affects Sprite and Textured Polygon, and is greyed for other Particle Types. There are two Depth of Field Types. Square (AE). 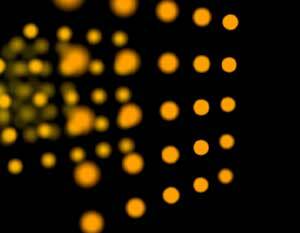 This mode uses the same square aperture that After Effects uses internally for DOF. This kind of render is useful when other elements are treated with AE's own DOF. Smooth. This mode gives a smoother DOF effect that in most cases looks more realistic. Its render is slightly slower than the Square mode. Opacity sets the transparency of the entire Form layer. The default value of 100 makes the particles fully opaque. Lower values make the particles more transparent. Motion Blur gives a smooth look to fast-moving particles, like a real world camera does Read more on the Motion Blur group page.